I defy you to find a situational comedy on television on a hotter streak than Bob’s Burgers is right now. I’m willing to append the modifier of “animated” to that previous sentence depending upon how Community’s fifth season fares, but for now, the crown is completely in the hands of the Belcher family. This week, one of the show’s best storytellers, Scott Jacobsen, holds the reins for the episode, and he once again finds that perfect balance between the ridiculous and the heartfelt. On one side, you have Linda attempting to make sure her kids have as typical an upbringing as possible by organizing a surprise slumber party for Louise; on the other, we are introduced to Linda’s fascination with a raccoon that roots through their dumpster at night, a raccoon she has named Little King Trashmouth. The plan almost entirely works, but for one girl, Jessica, who had turned in early because she wanted to hide her bedwetting problem. When Louise tries to roust Jessica out of bed (“Alright Snorey Feldman…”), there’s nothing there. Jessica is out searching for the plastic bag holding her soiled pajama pants, which had gotten mixed up with the bags carrying the girls’ tie-dye projects. Here’s where the raccoon comes in. Linda brings Little King Trashmouth into the house to protect it from another raccoon nicknamed El Diablo. Her plan is to capture the “evil’ raccoon and return the “good” one to his dumpster throne. Trashmouth, of course, gets loose in the house, but not before charming Bob. (“He just looked right into my eyes. I think he gave me the double guns. Let’s put a hat on him.”) The raccoon then gets a hold of Jessica’s soiled PJs, revealing her unfortunate secret to Louise. Sweetly, Louise isn’t amused or horrified by this. She’s rather impressed by Jessica’s resourcefulness and has no intentions of turning her into a punch line at school. (“I’m no narc! What is this, the ’90s? !”) After all her screams of agony, she might actually have found a friend. I have to admit that this is the episode I laughed the least at. Some of that may be due to a lack of punchy dialogue from the other kids (though I do want to know more about Ken, Eugene’s imaginary “adult albino friend who does improvised hip-hop”), but there wasn’t a huge amount of stuff to guffaw at. 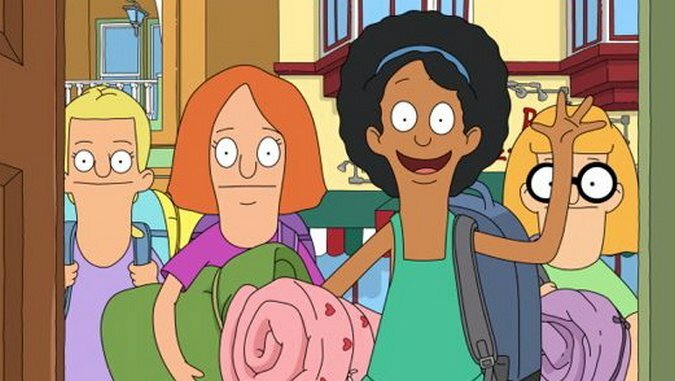 Instead, “Slumber Party” turned out to be the most subtly heartwarming edition of the show’s fourth season, with Linda’s worries for her eccentric kids and Louise’s slight insecurities leaching in to the story quietly. That is flat out exceptional scriptwriting, folks, and another reason why you shouldn’t miss out on the peerless run Bob’s Burgers is on.